New York, NY, November 16, 2017: Today the American Heart Association (AHA), American Stroke Association (ASA), and the American Medical Association (AMA) announced a new public service awareness (PSA) campaign in partnership with the Ad Council. The campaign seeks to raise awareness of the serious, life-altering consequences of uncontrolled high blood pressure, and motivate people to work with their doctor on developing and committing to a treatment plan to manage their blood pressure. Launched on the heels of a new guideline that means more people will have high blood pressure, the new campaign features actual stroke and heart attack survivors to show viewers the devastating consequences of uncontrolled high blood pressure—underscoring the urgency of controlling the condition. An estimated 103 million American adults now have high blood pressure, but only about half have their condition under control. While most people know what their blood pressure numbers are, many don’t feel an urgency to manage them because there are often no signs or symptoms associated with high blood pressure—which is why it’s often referred to as the “silent killer.” If left untreated, high blood pressure can lead to potentially fatal consequences like heart attack and stroke. Although there is no cure for high blood pressure, it can be managed effectively by working with a doctor to create a treatment plan, which includes healthy lifestyle changes such as eating a healthy diet, exercising, consuming less salt, drinking alcohol in moderation, losing weight if overweight, and taking medication if needed. Based on the latest available science, the 2017 Guideline for the Prevention, Detection, Evaluation, and Management of High Blood Pressure in Adults now considers a person to have hypertension when they have persistently elevated blood pressures at or above 130 systolic or 80 diastolic. While this now means that nearly half of all American adults have high blood pressure, treatment still begins with lifestyle changes. Both the new guideline and PSA campaign encourage people to adopt healthy behaviors and prevent problems by gaining awareness of their blood pressure and taking earlier action to control it. 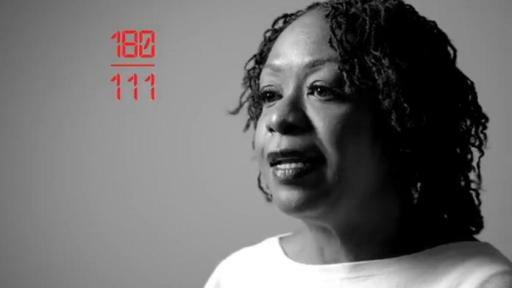 The new “HBP Numbers” campaign links blood pressure numbers to the real effects of high blood pressure by helping viewers visualize the consequences from people who have suffered a heart attack or stroke. The PSAs, developed pro bono by Havas Adrenaline and filmed by renowned photographer and director Marco Grob, provide a hopeful and empowering message that anyone with high blood pressure can lower their risk of heart attack or stroke by talking to their doctor and finding a treatment plan that works for them. Research suggests that adults with high blood pressure don’t always realize that their treatment plan can be modified to fit their lives, and they face several barriers to sticking to a plan--time, willpower and consistency with medication are the most frequently mentioned challenges. It has also been shown that awareness of the serious consequences of uncontrolled high blood pressure motivates people to take action to manage their condition. With this in mind, the campaign empowers patients to talk to a doctor and address this important issue together. The campaign encourages viewers to visit LowerYourHBP.org and BajeSuPresion.org to find resources in English and Spanish that will help them understand their numbers, commit to a plan in partnership with their doctor and learn to manage their blood pressure. The digital experience also includes stories of people who experienced a heart attack or stroke because of high blood pressure. “The honest power of these different personalities, the openness in which they revealed their physical and psychological scars will make people who write-off high blood pressure as just a number, immediately re-think the issue. Hopefully a lot of people’s lives will change or even be saved because of this effort. And that’s a tremendous reward for all of us involved,” said Havas Adrenaline Chief Creative Officer Rich Russo. The American Heart Association, American Stroke Association, and American Medical Association are also working with their local offices, affiliates and partners to promote and activate the campaign in their communities, with evidence-based materials to aid physicians and other health care providers in the plan-building process. The American Heart Association, the world’s leading voluntary health organization devoted to fighting cardiovascular disease, is devoted to saving people from heart disease and stroke – the two leading causes of death in the world. We team with millions of volunteers to fund innovative research, fight for stronger public health policies, and provide lifesaving tools and information to prevent and treat these diseases. The Dallas-based association is the nation’s oldest and largest voluntary organization dedicated to fighting heart disease and stroke. To learn more or to get involved, call 1-800-AHA-USA1, visit heart.org or call any of our offices around the country. Follow us on Facebook and Twitter. American Medical Association The American Medical Association is the premier national organization providing timely, essential resources to empower physicians, residents and medical students to succeed at every phase of their medical lives. Physicians have entrusted the AMA to advance the art and science of medicine and the betterment of public health on behalf of patients for more than 170 years. For more information, visit ama-assn.org. Ad Council The Ad Council brings together the most creative minds in advertising and media to address the most worthy causes. Its innovative, pro bono social good campaigns raise awareness. They inspire action. They save lives. To learn more, visit Adcouncil.org, follow the Ad Council’s communities on Facebook and Twitter, and view the creative on YouTube.